Indium Corporation will feature its new high-melting lead-free solder paste technology, BiAgX®, at Semicon China on March 18-20 in Shanghai, China. BiAgX® was created specifically for high-reliability electronics assembly applications. 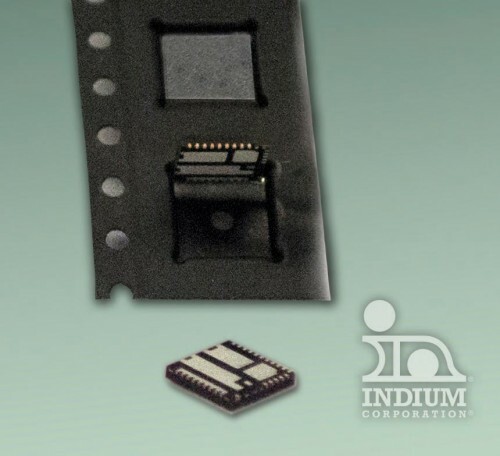 Designed as a drop-in replacement for standard high Pb-containing solder pastes, it has passed MSL1 and thermal cycle testing at several power semiconductor customers. BiAgX® is excellent for small, low-voltage QFN packages that are used in portable electronics such as smartphones and tablets. It excels in high temperature environments in excess of 150°C, requires minimal process adjustments, and no capital expenditures for customers converting from a standard high Pb-containing solder paste-based process. BiAgX® addresses both customer demands and potential legislative changes that eliminate lead from high-melting die-attach applications. It is both Pb-free and Sb-free and does not contain costly specialty materials, such as nanosilver or sintering aids. BiAgX® reflows, solders, wets, and solidifies just like any other solder paste, and is available in both dispensing and printing forms. Fluxes are cleanable with standard cleaning chemistries and processes. Indium Corporation will be exhibiting at booth 2316. For more information about Indium Corporation’s BiAgX® solder paste technology, visit www.indium.com/BiAgX, or email amackie@indium.com.